TuvixHosting is one of many seedbox host providers that one must try. You would benefit the high performance of unmanaged servers guaranteed with lowest price yet unpaired SSD servers. On this review, Seedbox Guide would like to give you an idea on how does a Shared Seedbox – Advance plan with 450 storage space in a 1Gbps connection and has unlimited bandwidth would perform. This plan being reviewed is hosted either in France, Netherlands, UK and Canada. Other TuvixHosting plans they offer are available here: TuvixHosting Plans. TuvixHosting is above par from the other host providers being reviewed as of the moment. The speed started to climb up to almost 58Mbps just within few minutes which is not bad for rutorrent client used by average users. Analyzing the file sizes based from the actual downloading and uploading acitivity using TuvisHosting Shared seedbox, you would notice that 5Gb of assorted files from different trackers in no time. Take note also that these are all in normal priority. Talking about my own experience, TuvisHosting responds in no time. This makes them one of the best host providers that Seedbox Guide has ever reviewed. Sending a ticket is easy but receiving replies is a different story. One’s patience is always being tested yet TuvixHosting has a personal touch in terms of receiving clients either for inquiries or for troubleshooting. Another remarkable feature TuvixHosting offers is the real time Network Status. Try subscribing with one of their plans and you would see how is your seedbox performing. You would know whether your seedbox server is down, having DNS problems that affect your system. Added to that, you would see also how your server is performing. TuvixHosting’s softwares installed are reliable specification. The OS installed for us, which is ubuntu, and running a torrent client rutorrent is noticeably performing well as we made our test for this review. By subscribing to their services, you will have a dashboard where you can find your order’s specifications that you need for a quick look. Who would not want a dashboard where everything’s arranged for you for easy reference? 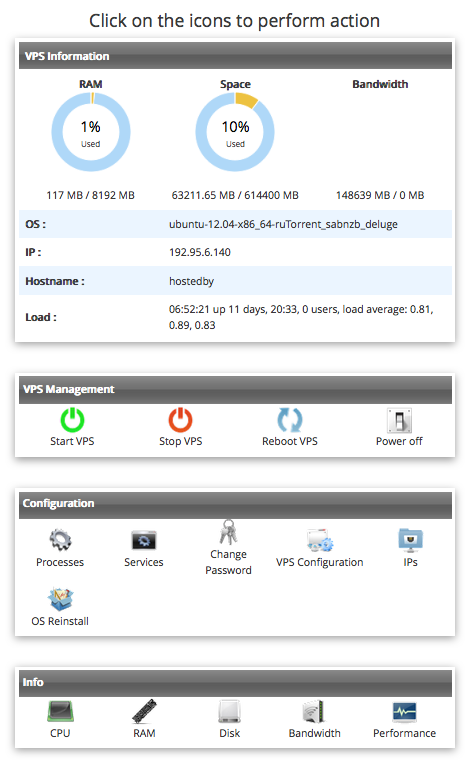 VPS information and management as well as the configuration and info you for seedbox are well presented. Below is an example of what you will have in order to see your own seedbox’s status at a quick glance.